Whatever you call them, their power has been on full display this week as a disconnected, self-serving elite concentrated in the media and government has attacked Donald Trump mercilessly in a final battle to maintain and enhance its own power. The weapon of mass destruction deployed by the deep state in this battle is a scurrilous and completely unfounded “dossier” purportedly showing that the Russians have a blackmail file on President-elect Trump, including damaging reports of prostitutes and shady business dealings with Russian President Vladimir Putin’s kleptocratic regime. That none of it is true and the report is full of childish errors and demonstrable falsehoods matters not a whit in this battle, because the battle is not about facts or truth, but about power. Consider the convoluted route this bundle of slime took to reach the public to undermine the President-elect on the eve of his first news conference in six months and a week before his inauguration. After having been shopped to and rejected by the media since last summer the report, prepared not by a disinterested intelligence agency or researcher, but by a commercial firm hired by Trump’s opponents, found its way to Senator John McCain. McCain, a Trump nemesis since the Republican primary season, is the military-industrial complex’s primary spokesman on Capitol Hill, and is also one of the loudest voices for a foreign policy of global interventionism by the United States. The deep state is especially concentrated in the security apparatus of the federal government, and McCain, claiming to do “what any good citizen would do” turned this amateurish smear over to the FBI, one of the central agencies of the deep state. Keep in mind the document McCain received was not something prepared in Russian and spirited out of the Kremlin, it is not a micro dot or other document obtained through the spycraft of James Bond or George Smiley, it was a copy, of a copy, of a copy, of something that the staff of the Chairman of the Senate Armed Services Committee should have been able to spot as amateurish and wanting of fact on first reading. No sooner had McCain sent the file to the FBI than the story of the existence of the file began to leak and the “news” became not the amateurish nature and dearth of facts in the report, but the fact that it was being discussed and vetted at the “highest levels” of the United States intelligence apparatus. And it was leaked to CNN and Buzzfeed, two media organizations deeply hostile to Donald Trump and his populist agenda and deeply embedded in the deep state. But this campaign to link Trump and Putin didn’t start after the election; it started last summer when, as Professor Stephen Cohen put it, Hillary Clinton and the Democrats decided to run against Trump and Putin, instead of Trump and Pence. Cohen, who has been studying Russia for 40-years, is professor emeritus of Russian studies at Princeton University and New York University, and contributing editor of the Nation, so he’s an unlikely defender of Trump and his policies. Cohen, who described the dossier as “junk” prepared by a private intelligence operative “out to make a buck,” said that if someone would send him to Moscow he could buy a better dossier, presumably without the obvious errors. Cohen concluded the interview with this insight, “I can only assume that there are people in this country who are desperate to wound Trump to stop any possibility of detente or cooperation with Russia… these accusations [themselves] have become a grave American national security threat." Professor Cohen is right, this didn’t happen by accident, and in being right he has pierced one of the dark shadows the deep state is casting over the Trump presidency and Trump’s national security agenda. 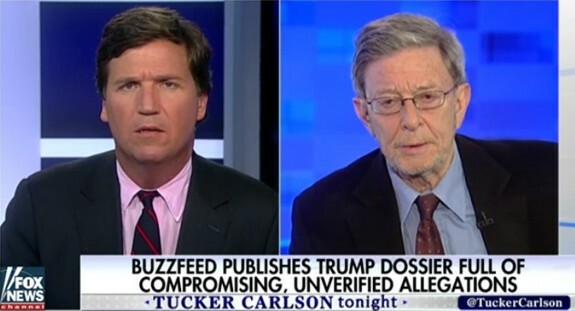 Click here to watch Tucker Carlson’s must see interview with Professor Stephen Cohen. George Rasley is editor of ConservativeHQ, and a veteran of over 300 political campaigns, including every Republican presidential campaign from 1976 to 2008. Rasley served in policy and communications positions on the House and Senate staff, serving as Director of Communications for Rep. Mac Thornberry, now Chairman of the House Armed Services Committee and Director of Policy and Communications for former Congressman Adam Putnam then Vice Chairman of the Oversight and Government Reform Committee's Subcommittee on National Security and Foreign Affairs. He served as lead advance representative for Governor Sarah Palin in 2008 and has served as a staff member, consultant or advance representative for some of America's most recognized conservative Republican political figures, including President Ronald Reagan and Jack Kemp. During the George H.W. Bush administration he served on the White House staff of Vice President Dan Quayle. Submitted by Arizona Don on Fri, 01/13/2017 - 09:41. How John McCain got reelected in Arizona after his antics of calling Trump supporters crazies I do not know. Perhaps the democrats elected him. He is certainly not conservative. McCain is the poster boy for why there “must” be term limits on congressmen and women in both houses. It however is doubtful that will ever happen without a state convention. Or in other words done outside the legislative branch of government. Perhaps in the next eight years it will get done. Flake is another just like McCain. He needs to go as well. Maybe in 18 we can get rid of him. Submitted by email_registrat... on Thu, 01/12/2017 - 17:41. There are people in this world who started out belonging to the Bilderbergs and are now in a myriad of other organizations who just really want one thing, power for power is the path to money, fame, adulation/worship and you do not have to look very far to see this in all aspects of our own goverment and our own president at this last moment, obama. Of course you also have the liberal press ready and willing to support any of those globalist egos and the countless minions who aspire to be like them to have their itching ears scratched. Anyone the least bit familiar with current events could sit here all day and name them. One day very soon now their forms of pleasure will come to an abrupt end even though they may not realize it now, We still have a very few honest God fearing men of God/preachers who are standing in the breach. Submitted by Charles Martel on Thu, 01/12/2017 - 13:52. Ever since CIA operatives Joe Wilson and Valerie Plame first sought to discredit President George W. Bush's claim that Saddam Hussein was seeking nuclear materials with a bogus "fact-finding" junket to the U.S. Embassy in Niger, then tried to have Bush Administration officials prosecuted for disclosing information that they themselves disclosed, I have suspected that operatives in the U.S. "intelligence community" are using its usual spycraft and disinformation campaigns to sabotage Republican presidents and anyone else who does not share their Marxist-Statist ideology. I call this group the "Philip Agee Brigade," after the CIA traitor who in the 1970s disclosed the identities of anti-communist informants, then fled to Castro's Cuba. Now their amateurish efforts to destroy our president even before he's sworn in shows a willingness to completely destroy the United States in order to keep the reins of power out of anyone's hands but their own. When Trump won the election I thought we had a temporary reprieve that would allow us to undo (at least partially) the destruction of the American republic. Apparently not, as long as these traitors are still in place. Submitted by AmericanBelle on Fri, 01/13/2017 - 12:56. Scooter Libby went to jail because of the "outing" of CIA desk jockey Valerie Plame. Democrats went wild over the fact that this "agent" had been exposed in the public and could hurt assets overseas. Such a big fuss. Yet when the Chinese government hacks/steals more than 20 MILLION personnel records from OPM listing all personal contact info on each person as well as their security classifications, the government, the media, said absolutely nothing!